We've been trying to sell the boat for quite a while, as you know. It was suggested to list it on "boats for sale by owner". I did that. A person seemed interested, but I had my doubts. He wasn't interested in seeing the boat. Anyway, he sent a check and it bounced because he stopped payment. Very questionable. Anyway he said he is going to send another check. In the middle of this, we were evacuated from Paradise because of the Camp Fire. We've been gone for 2 1/2 weeks. We probably won't get back just to look at the property for two more weeks. The boat survived as well as our house. (Webmaster Note - What's in a Name....) We are currently in Auburn, California. 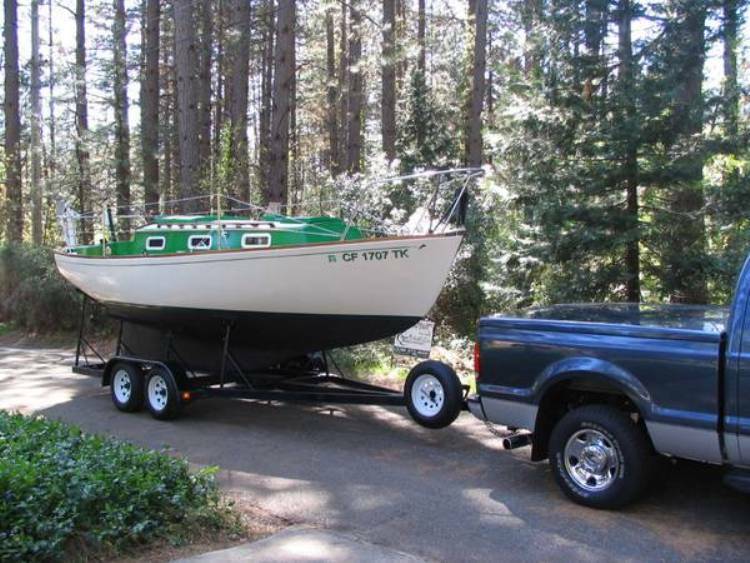 So, to answer the question, we still have the boat, but still trying to sell. April 1, 2017. Senior DFI John Cotton brought this to our attention. No foolin, Fire Escape is FOR SALE. Here is the Craigslist ad and the link to the ad. Must see...24 ft. with 8 HP out board motor. Full keel, life lines and wench. 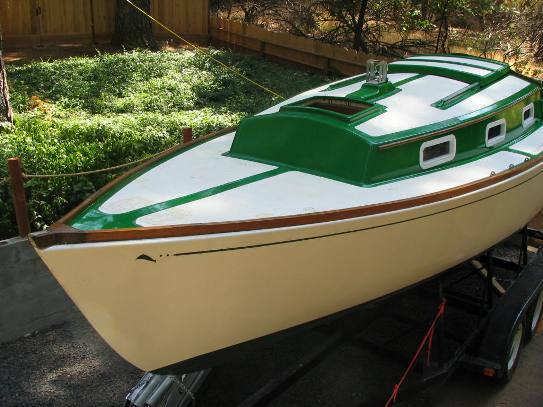 Includes 10 ft. Achilles tender with 4 HP motor. Also a boat tent and we have a Garmin marine GPS unit. Last sailed in the San Juan Islands. No problems during that 6 week trip. A couple of months previously Gordon sent in the following picture of Fire Escape's new deck paint job. January 3, 2008 Richard McConnell sent in the following report. 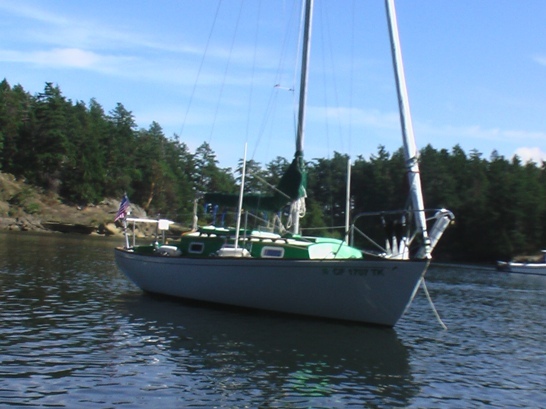 How I acquired my boat from the Thompsons: I knew that I wanted a full keel sail boat in the 22ft to 30ft range. I had seen other Dolphins on the web, but when I saw Gordon's webpage I was pretty sure that was the boat for me. I called him on the phone and we talked a little and I told him that we would come up to take a look. 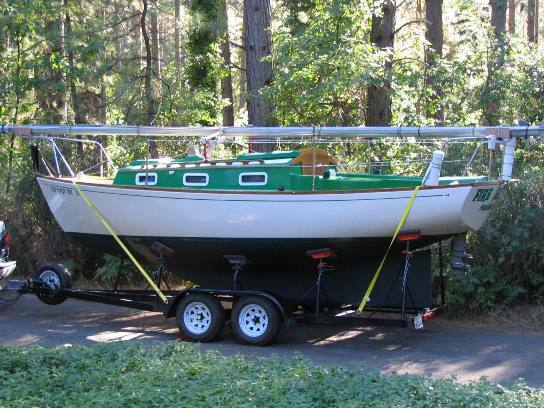 So my wife, Mary, and I flew to Portland went to Gordon's house and bought the boat. I told him I would be back to tow it to California as soon as there was no snow in the Siskyous, probably around March. We were unable to get the boat until May. Once we got it home we started the renovation. We sanded and refinished all the teak on deck, put new nonskid on and painted it. After the renovation, we put it in a slip in Alameda Estuary where we performed sea trials and became comfortable with the boat. We named it Fire Escape because I am a retired firefighter. Gordon and Suzanne were gracious enough to invite us to meet them at Port Townsend where they had their new boat and we spent three weeks touring the San Juan Islands with them. They were very patient and we are very grateful for the knowledge and time they devoted to our enjoyment of the San Juan's. Before we went up there we had jack screws installed on the trailer which sure helped traveling such a long ways. 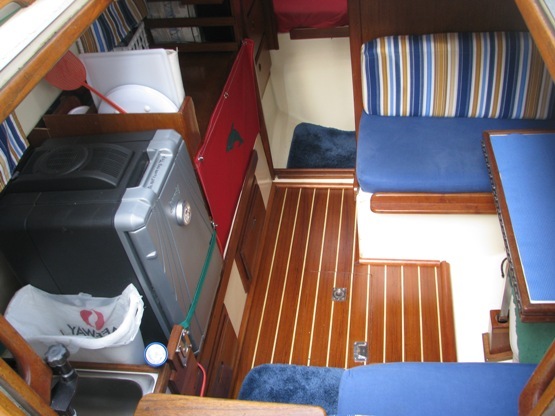 We have made some modifications to the interior adding a food box on the port settee and some cushion covers, window curtains, V berth covers, sail cover, tiller cover and winch covers out of sailrite material. Our only plan this year, other than routine maintenance, is an electric refrigerator. Enclosed find a picture of the day we returned home from the San Juan's. December 2, 2009. 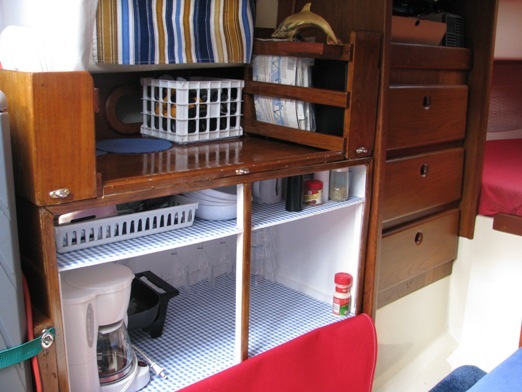 Richard sent in pictures of Fire Escape's interior with her new electric fridge and galley box (behind the dolphin on the red snap on lee cloth). The black and grey unit is a Coleman 40 qt capacity 'Thermoelectric' Cooler Model # 5644, with both 12v and 110v power. March 14, 2016. We got the following update from Richard responding to a webmaster request for an update. Last we were on Fire Escape was August and September of 2011. We had a great time as usual in the San Juan Islands. Last morning on the water after leaving Anacortes we hit some very bad weather. The boat rocked and kicked. It was also foggy. Mary was thrown onto the floor of the cabin and the table was on top of her. We somehow managed to get into Port Townsend unscathed. It was a great trip although scary at times. Due to health problems we haven't used the boat since then. It's still in great shape although could use a good wash down.